Sergio Perez says he wants to stay at Force India next season and expects a new contract to be announced soon. The Mexican, 25, has been linked with a move to the financially-troubled Lotus team, who may be sold to Renault. Perez expects to continue alongside Nico Hulkenberg, who signed a new deal earlier this week. "My priority is to stay here. The team is going upwards and is really pushing, and I know the plans of the team so I am really happy to stay here," he said. Perez is hopeful his future will be resolved before the race in Singapore on 20 September. 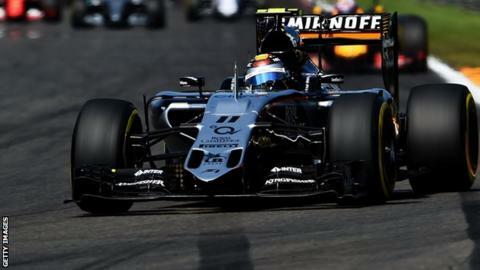 The former McLaren driver finished fifth in the Belgian Grand Prix last month. He is 11th in the drivers' championship with 25 points, one more than German team-mate Hulkenberg.